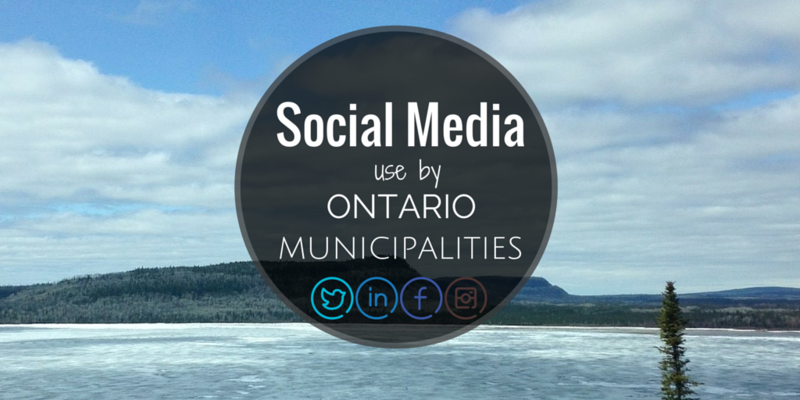 Inspired by a recent project, coupled with an interest in local government, I began researching what social media platforms were being used by Ontario municipalities. The Ontario Ministry of Municipal Affairs and Housing website was used. The listing organized municipalities into lower, single, or upper tier. Each municipality’s website (if available) was visited. Upon visiting the municipality’s official website, social media accounts were accessed (if available). If no social media accounts were listed on the official website, then it was assumed that they did not exist for that municipality. 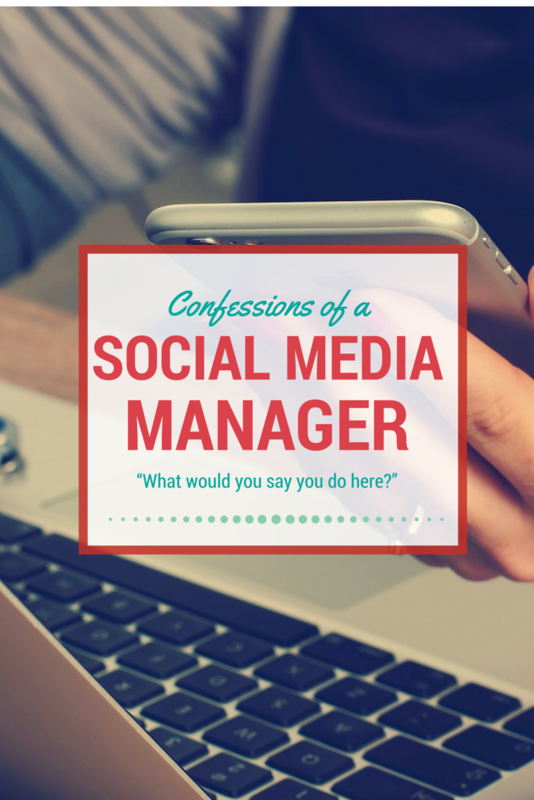 Only official municipal social media sites were included. As a result social media accounts for emergency services, libraries, or economic development were not included. 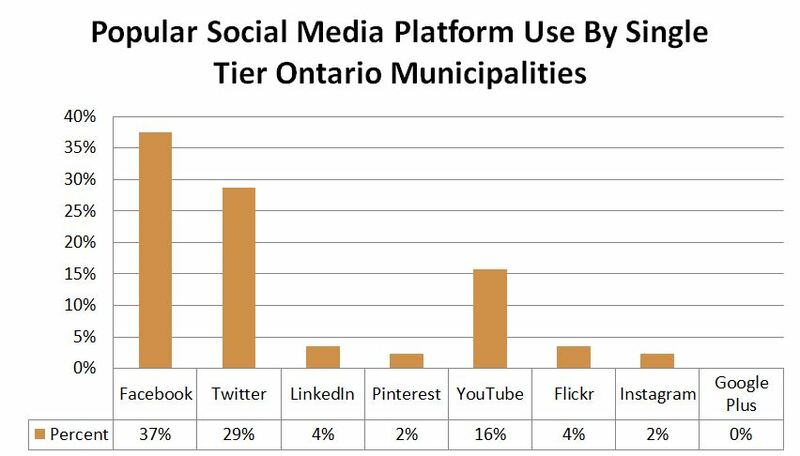 Research found that 47% of Ontario municipalities use the iconic social media site Facebook, followed by 40% of Ontario municipalities using the micro-social media site Twitter. 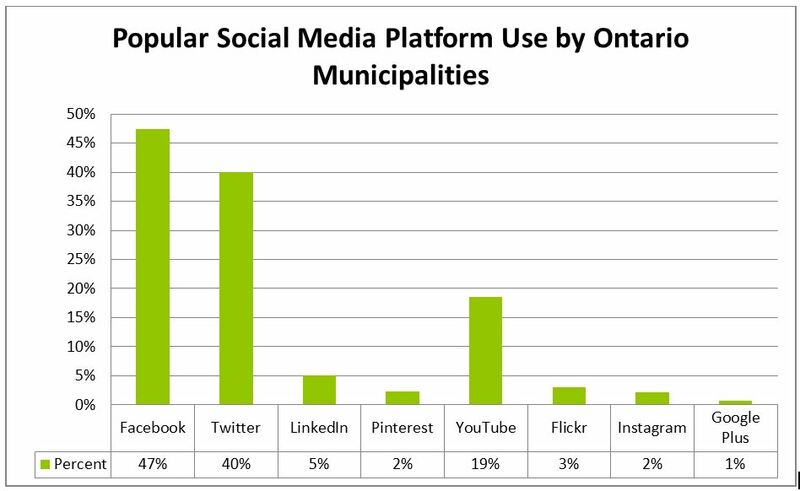 In addition, 19% of Ontario municipalities utilize the video-sharing platform YouTube. The least used platforms were LinkedIn (5%), Flickr (3%), Pinterest (2%), Instagram (2%), and Google Plus (1%). Breaking the information down by the municipal tier system, it was found that 53% of lower tier municipalities use Facebook. In addition, 46% of lower tier municipalities use Twitter. Consistent with the provincial numbers, 19% of lower tier municipalities utilize YouTube. Lower tiered municipalities are typically located in southern Ontario. 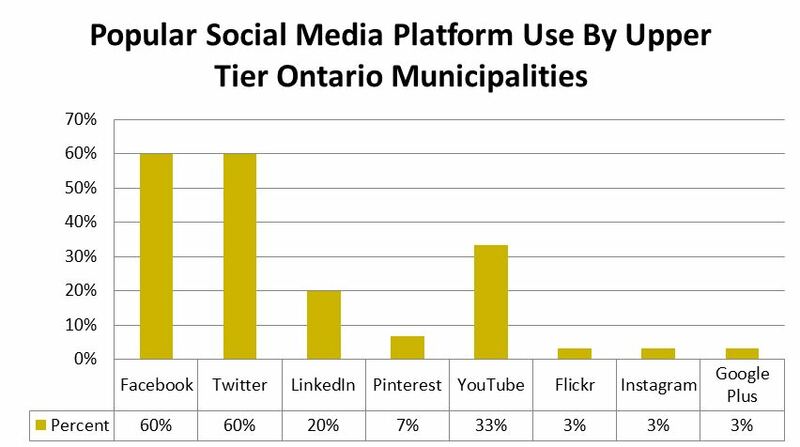 Research discovered that single tier municipalities did not utilize social media within their municipality as much as lower or upper tier municipalities. 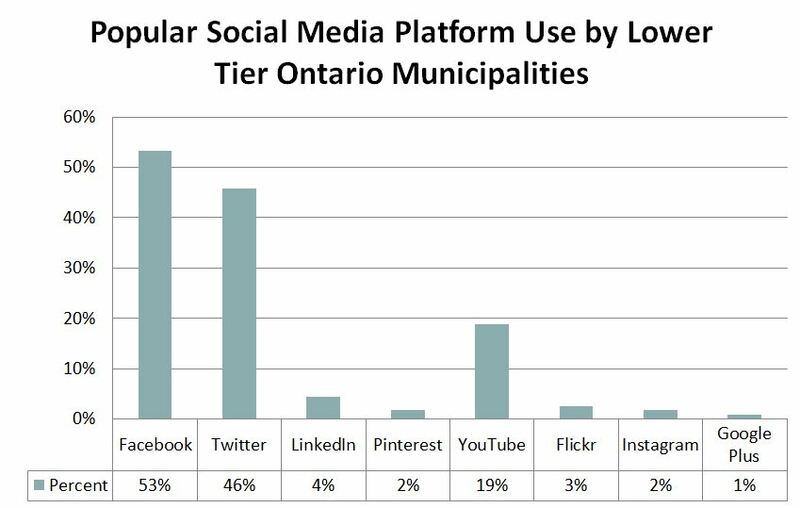 Facebook use among single tier municipalities was only 37%, followed by Twitter (29%), and YouTube (16%). Single tier municipalities are primarily located throughout northern Ontario, with a few located within southern Ontario. 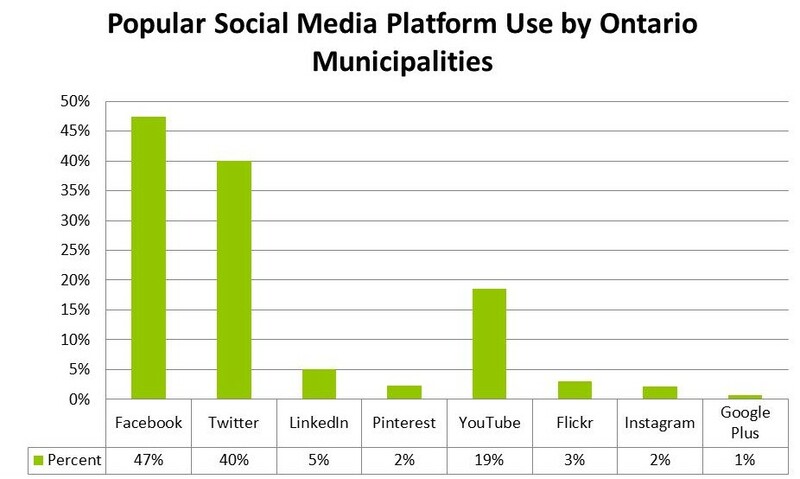 It was found that upper-tier municipalities had a strong focus on social media use. Facebook and Twitter usage was tied at 60%, followed by YouTube (16%). Currently Ontario has 30 upper-tier municipalities all of which are located in southern Ontario. Additional research about this topic will be released as it comes available.